I. Krešić, G. Labeyrie, G. R. M. Robb, G.-L. Oppo, P. M. Gomes, P. Griffin, R. Kaiser, T. Ackemann, Communications Physics 1, 33 (2018). Nonlinear systems away from thermodynamic equilibrium can show interesting effects such as spontaneous organization past a critical point. Lately cold atoms have been used to emulate processes in condensed matter physics. It is believed that the control offered by cold atom systems will provide a better understanding of fundamental physics in new materials. This work reports on self-organization of atom magnetic dipoles in a system illuminated by laser light which emulates interactions within magnetic materials. This work shows that the interaction between magnetic dipoles is mediated by laser light and that this interaction can be changed by applying homogenous magnetic field. In the absence of magnetic field the ordering is antiferromagnetic, and a longitudinal field makes the dipoles organize ferrimagnetically with first neighbors antiparallel but with a net dipole moment along the magnetic field. When transversal magnetic field is applied, the behavior of dipoles is well-described by transversal Ising model. Self-organization in the system under study. 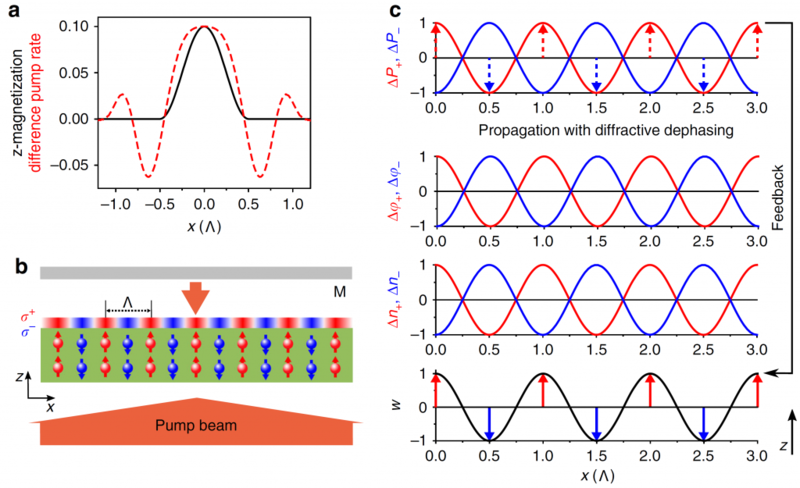 a) Laser-mediated interaction of localized magnetic dipole mediated with optical pumping. b), c) The mechanism of self-organization caused by diffraction and a mirror at short distances from the grating utilizing the Talbot effect. Talbot effect is a periodic phase and amplitude modulation of the transmitted laser beam after the optical grating. In this nonlinear system it allows for self-organized structures the scale of which is defined by mirror position. Talbot effect also allows in-situ probing of magnetic dipole ordering via measurement of the laser beam profile. In this system the self-organization breaks the continuous rotation and translation symmetries of the initial state which opens the possibility to study new physical regimes containing large numbers of modes, a currently very active field of research which far has been limited to use optical resonators only. 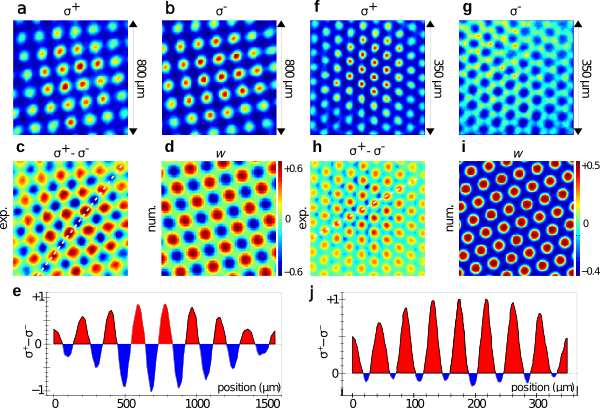 Experimentally obtained magnetically ordered states and their simulations. a)-e) antiferromagnetic ordering on a square lattice in the absence of magnetic field. f)-j) ferrimagnetic ordering on a hexagonal lattice in magnetic field of 120 mG. Scale of the optical grating can be changed by shifting the mirror.